It’s been quite a ride in the last two years since Hello Project Space has launched. As a collective, we have worked on some amazing projects and have been consistent on creating work that is both informative and grounded on strong visual aesthetics. We have been actively involved in the production of TV series, full-length documentaries, commercial campaigns, music videos, and short films that have gone on to win industry awards and festival screenings, including the prestigious Cannes Film Festival. As a boutique creative studio we have always implemented a simple and reliable post-production workflow. File storage is predominantly handled by a 2.66 GHZ Quad-Core Intel Xeon Mac Pro with 24TB of internal storage. With the nature of the industry we are in, the constant backing up of files are crucial. Most of our projects combine footage shot on the Canon C300, Canon 5D Mk2, and the Sony A7s with varying format, frame rate, and sizes. The scope of our projects also require different editorial workflows. 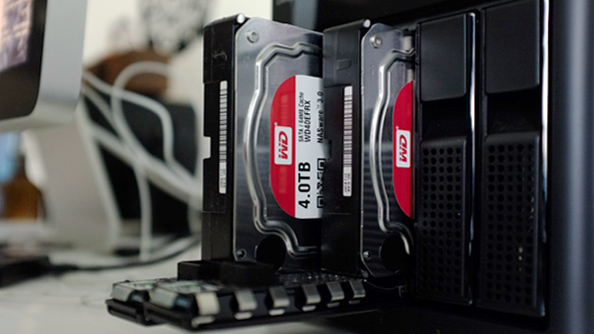 Our centralized shared storage allows us to distribute work across editors in the studio. However, secure remote file access is something that we have always wanted to add in the workflow. The flexibility of streaming HD videos, color treatment, and rough cuts and music compositions from your mobile phone, or laptop from anywhere is highly convenient. This is where the WD My Cloud EX4100 comes in – a remarkable prosumer network-attached storage (NAS) designed with the creative professionals in mind. When WD invited us to be part of their digital creative community, we couldn’t be any happier. As a storage industry pioneer and long-time leader, WD is the perfect collaborator for an all-digital editorial workflow. The version that has been sent to us was the EX4100 8TB setup, with (2) 4TB Western Digital RED drives occupying 2 of the 4-bay slots. Upgradeable to 24TB with different RAID options, this could be the ultimate in making your own secure and reliable cloud storage. We certainly would have welcomed a 24TB with a proper celebration, knowing that our storage requirement for the next year is sorted. Right out of the box, there was minimal setup required to get the EX4100 up and running. 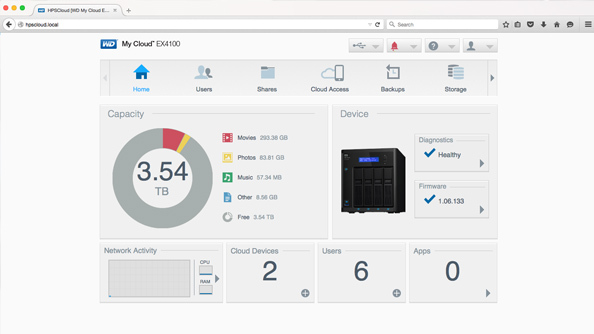 The layout and the UI is simple and practical, it presents the stats that you need when analyzing your NAS in a very precise format. Configuring your own creative cloud to a number of users, or groups who can access your file is relatively easy. The added email prompt when you are invited to the cloud storage leaves you with zero worries about unauthorized access. And once connected, access to your EX4100 via tablet or phone is also a breeze via a desktop or mobile app – My Cloud. One of the projects we were working on when we were sent the EX4100 was The Other Side video series. The Other Side is a new music concept in Dubai inspired by the live music scenes of Williamsburg Brooklyn, SXSW Austin, Shoreditch London, New Orleans, and others. We were given the task of filming for the event and producing short documentary-type vignettes that highlight the artists behind the band, their music and their whole experience during The Other Side live musical event. The show happens every two weeks, and it involves a quick turnaround, in parallel to other projects that we are working on. So this needed a specific workflow that would allow us to review footage on the go, even on remote locations. From the start, we knew we wanted to have maximum coverage so we were constantly filming from two different angles. 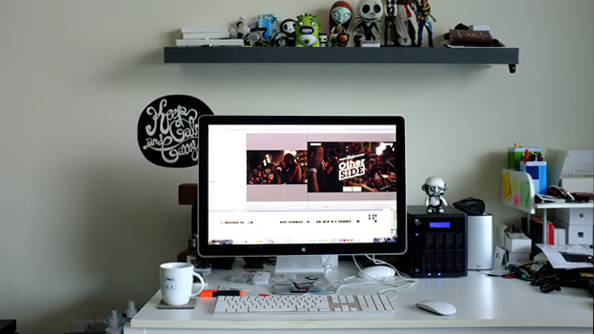 Post-production tools like Final Cut Pro, Adobe Media Encoder and Apple Color were essential to the workflow. The immediate backing-up of files to the EX4100 was fairly quick. With up to 116 MB/s write speed, transfers of around 60GB of HD footage can be well under an hour. We did some tests streaming uncompressed MOV files from tablets, and phones connected to the EX4100 via the My Cloud app, however the file sizes and data information was too much to stream over a network. After the back-up, proxy files of 640×480 resolution of the concert footage were then generated via the Brorsoft Video Converter. This streamed nicely across all digital devices connected to the EX4100. The constant viewing of the filmed band interview and actual concert footage provides immediate marking of the best takes – these would all go to our designer, generating small thumbnails and narrowing it down to a storyboard. This is where the storytelling kicks in. With the transcribed interviews of the band, we pull in all of the materials into Final Cut Pro. This is where we look for the dramatic beats and surprise moments from the shortlisted footage. We read the interview a few times and let the storyboard guide us to choosing the right footage that evoke the emotions that we are looking for. After rendering the first draft of the video, this will again be shared over the EX4100 network and streamed for everyone to comment on. Being able to view it on your mobile from anywhere makes the feedback process easy and fast, and this momentum instantly flows back into the editing process. Once the video is picture-locked, high-res versions of the footage are synced back into Final Cut Pro, sound-mixed, rendered and brought into Apple Color for color correction and color grading. With a team and tools in place, the goal is to move current projects that have quick turnarounds to the EX4100. Copying to and from the EX4100 was fairly quick and this is essential as we intend to copy huge amounts of HD video material on to the drive. Having the EX4100 as a shared network has allowed us to speed through storyboards, footage, rough cuts and music beds so much faster. Working with the WD My Cloud EX4100 for The Other Side video series is a great preview of how this prosumer NAS will fit perfectly into our post-production ecosystem. The Other Side presents The Wanton Bishops. Eisode 1. The Other Side presents Safar. Episode 2. The Other Side presents Zeid and the Wings | Loopstache. Episode 3. The Other Side presents Bosaina | Z the People. Episode 4.